Initiatives to build democracy in Cambodia since 1991 have met with little success. This is partly the result of the international community’s failure to account for Cambodia’s own perception of its history, combined with an inability to perceive the political and cultural realities on the ground. While governments and donors have continually advocated for democracy and human rights, they have prioritized political stability with a focus on a multiparty parliamentary system and civil society, contributing to a cyclical pattern of failure. At the same time Prime Minister Hun Sen and the ruling Cambodian People’s Party (CPP) have viewed democratization as a self-serving fiction and a threat to their existing networks of governance, undermining the democratic agenda for personal gain. While democratic ideals and elections remain important sources of regime legitimacy, neopatrimonialism remains the predominant influence on Cambodia’s political trajectory. Despite the international community’s belief that elections are sufficient to ensure democratic governance in Cambodia, polls have been utilized as a redistribution mechanism for patronage. Since 1993, Hun Sen and the CPP have utilized elections to maintain a democratic mirage internationally to secure development aid, while the electoral process has been abused domestically to build party membership and reinforce the CPP’s authority, linking the distribution of development projects to support at the polls and thereby making the party-state indispensable to citizens. Despite the CPP’s manipulation of the electoral process and the continuing expansion of patronage throughout the 1990s and 2000s, the international community remained convinced that Cambodia was on a political trajectory to becoming a fully-fledged democracy, with donors pledging billions of dollars in an attempt to maintain the momentum of the United Nations Transitional Authority in Cambodia (UNTAC). Given Cambodia’s violent past, the bar was set low. Hun Sen and the CPP were viewed as the lesser evil while unprecedented access to international aid and free market economics entrenched corruption with the CPP, diverting financial resources in order to establish a highly centralized opaque network that encompasses political, economic and military elites. International donors advocating for a greater emphasis on democracy and human rights have now been supplanted through China’s strategic efforts to assert itself politically and economically across Southeast Asia. With little in the way of conditions established, the influx of aid and investment from China is a welcome respite for Hun Sen and the CPP, given their continued frustration at having to maintain a democratic façade. Cambodia has been flooded by increasing Chinese aid and investment, which is funding construction and infrastructure projects across the country in addition to the establishment of a Special Economic Zone (SEZ) in Sihanoukville. With greater capacity to maneuver, Hun Sen and the CPP undertook a systemic altering of the country’s constitutional and legal framework to overwhelm political opponents and civil society. These efforts accelerated after popular discontent became widely evident, with tens of thousands attending the funeral procession of outspoken political activist Kem Ley, followed by the 2017 commune elections. The end result was the dissolution of the main position party, the Cambodia National Rescue Party (CNRP), in November 2017, and the arrest of its leader, Kem Sokha, who has been charged with treason. While Cambodia was never a democracy, the presence of the CNRP and their impact in the 2013 elections did create some space for debate and, to a lesser extent, some reforms within the CPP, even if these were largely symbolic, such as engaging the youth via social media. However, with the CPP’s alleged outright electoral victory marking the end of the Cambodia’s dalliance with democratic ideals, this is no longer likely. While 19 opposition parties were allowed to compete in the recent elections, Cambodia’s electoral system is designed to put smaller parties at a strategic disadvantage. A more worrying concern has been integration of the security apparatus into the governance structures of the state, with military figures loyal to Hun Sen being promoted in the run up to elections and the CPP fielding candidates from the military and police. 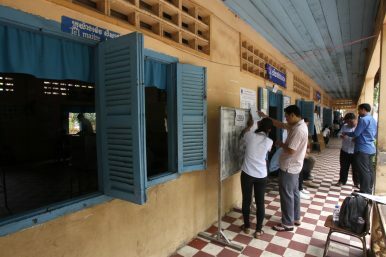 Efforts spearheaded by former CNRP lawmakers to encourage voters to boycott the election were countered by government authorities claiming such actions as illegal and with reports that local officials threatened to withhold basic services and that employers promised to sack workers who refused to vote. Social media activity was heavily monitored through the establishment of an inter-ministry working group, the aim of which was to prevent the release of information that may “cause social chaos and threaten national security,” while NGOs were prevented from monitoring the election, with “zombie monitors” being shipped in. There is no doubt that Cambodian society was frustrated by the CPP’s actions as attempts for political reform continue to be stifled, with even the few mediums through which Cambodians were able to entertain their political aspirations now shut off. While the alleged high voter turnout would suggest that the CPP’s efforts to legitimize its rule succeeded, public discontent over the political situation is evident through the record number of spoiled ballots when compared to previous elections, although owing to the absence of independent media, the levels of voter discontent remain grossly under-reported. What has made the recent political events particularly disconcerting is the marginalization of Cambodia’s younger generations. With two-thirds of the population under 30, Cambodia’s youth will play a significant role in the country’s future political trajectory. Having grown up in relative peace and political stability, with wider access to education and politicized content via social media and independent news sources, Cambodia’s youth attribute their limited political and economic power, and scant opportunities for social upward mobility, to corruption and nepotism under the CPP. Politically informed and born after the civil war and/or demobilization of the Khmer Rouge, Cambodian youth undermine the CPP’s liberation propaganda, expressing little fear for political change while believing they should be free to choose who they vote for. Cambodian youth also remain marginalized economically. While many have migrated to urban centers, stable work is hard to find, with 64 percent in vulnerable employment, excluding many from the few social benefits that exist in Cambodia’s formal employment sectors. Unprecedented migration of youth from rural to urban areas in search of employment has also disrupted the traditional structures of patronage under the CPP, creating political and social networks outside the party’s control. However, there seems to be little in the way of economic or political reforms that can address the aspirations of Cambodia’s youth, or indeed wider society. Despite Cambodia boasting low unemployment figures, the wealth gap continues to increase. Fifty-one percent of jobs are categorized as “vulnerable” and in 2011, 72 percent of Cambodians lived on less than $3 per day. Cambodia’s current rate of economic growth is largely reliant on garment exports accounting for 68 percent of total exports in 2017, which is unsustainable given lower labor costs in neighboring countries. The political economy remains an opaque system of governance and corruption. The CPP’s poor governance record suggests that growing inequality, financial instability, poor urban planning, and environmental degradation are unlikely to be addressed any time soon, further challenging sustainable growth and stability. A further concern is Cambodia’s increasing dependence on Chinese loans and other forms of foreign direct investment. While the investment is welcomed by the CPP, there are warning signals as the increasing imports of capital goods for use mainly on China-funded infrastructure projects has widened Phnom Penh’s trade deficit to 10 percent of GDP. Prime Minister Hun Sen and the CPP would also be wise to consider the concerns over debt sustainability surrounding Belt and Road Initiative projects, exemplified by the Sri Lankan government’s transfer of the Hambantota port ownership to Beijing when it could no longer afford the repayments. There are also a number of concerns regarding Chinese regulators’ attempts to prevent out-of-control risky lending practices which, if left unchecked, could spark contagion across China’s financial system and affect any and all countries on the receiving end of substantial loans from China. Hanging over Cambodian society’s marginalization and precarious economic growth is the Damoclean threat of sanctions and the removal of preferential trade arrangements that would decimate Cambodia’s garment industry – a significant source of employment. The EU is considering the country’s status under the Everything But Arms (EBA) scheme, given their displeasure over Cambodia’s political trajectory. Such measures will likely have a devastating impact on Cambodia’s poorest communities, while proving to be a self-fulfilling prophecy that would reify the CPP’s stance on Western double-standards and outside powers trying to undermine Cambodia’s peace and stability. Human rights violations are widespread in Southeast Asia, under regimes ranging from illiberal democracies to military juntas and de facto one-party states. Yet the EU maintains sanctions only on Myanmar. While the U.S. maintains targeted sanctions on individuals across the region, these have achieved little apart from, it could be argued, national virtue signalling. After the United States blacklisted the commander of Hun Sen’s bodyguard unit, Hing Bun Heang, Chinese Defense Minister Wei Fenghe arrived days later to sign a $100 million military grant. While Cambodia’s traditional customs and habits continue to buttress neopatrimonialism, the country is changing rapidly as international engagement contributes to Cambodia’s integration into the global economy. With Cambodian household income gradually rising, and an increasing reliance on formal lending systems, Cambodian citizens are relating their needs to the political program. However, while economic and social transformations have seen Cambodians adopting new lifestyles and seeking empowerment and upward mobility, these aspirations can only be realized by programmatic policies more recently exemplified through the CNRP’s policy platform of supporting household incomes, which aimed to address the expectations of Cambodian society. With Cambodia becoming Southeast Asia’s latest de facto one-party state, the most pressing concern is that Hun Sen and the CPP have closed off another avenue for peaceful opposition and the attainment of political and economic aspirations in a society with vulnerable employment and widening inequality, while sanctions threaten to decimate one of Cambodia’s largest sources of employment. Despite concerns within the CPP over the customs bill incurred should the EU reconsider Cambodia’s status under the EBA scheme, recent rhetoric would suggest it is unlikely that the CPP will change tack anytime soon. Forthcoming reforms, if any, would be slow given the political and social unaccountability within the party thanks to a weakened state capacity; a knock on effect of patronage networks, aid fungibility, and a lack of political will from the CPP. While economic measures and targeted sanctions may seem like the answer for the EU, United States, and other international actors who wish to see political change in Cambodia, they would likely exacerbate the situation by undermining political and economic stability. Old Tricks at Play in Cambodia’s New RepressionWhy Is Cambodia’s Illegal Logging Problem Still Rolling On?The Life and Near Death of Sam RainsyJanuary 7 in Cambodia: One Date, Two NarrativesA New Era for Hun Sen’s Cambodia?